The ZYX Change Method for Investing and Trading is a unique, proven process to profit from change by trading and investing. The method has an enviable track record of working well in both bull and bear markets. The ZYX Change Method is the culmination of over a quarter of a century of experimentation in developing fundamental, technical, and quantitative models as well as implementing gray boxes to execute the models in a variety of market conditions. The Methodology has been equally well applied to different time frames ranging from years to hours. The premise behind the ZYX Change Method is that the most money is made with the lowest risk by successfully predicting change before the crowd. 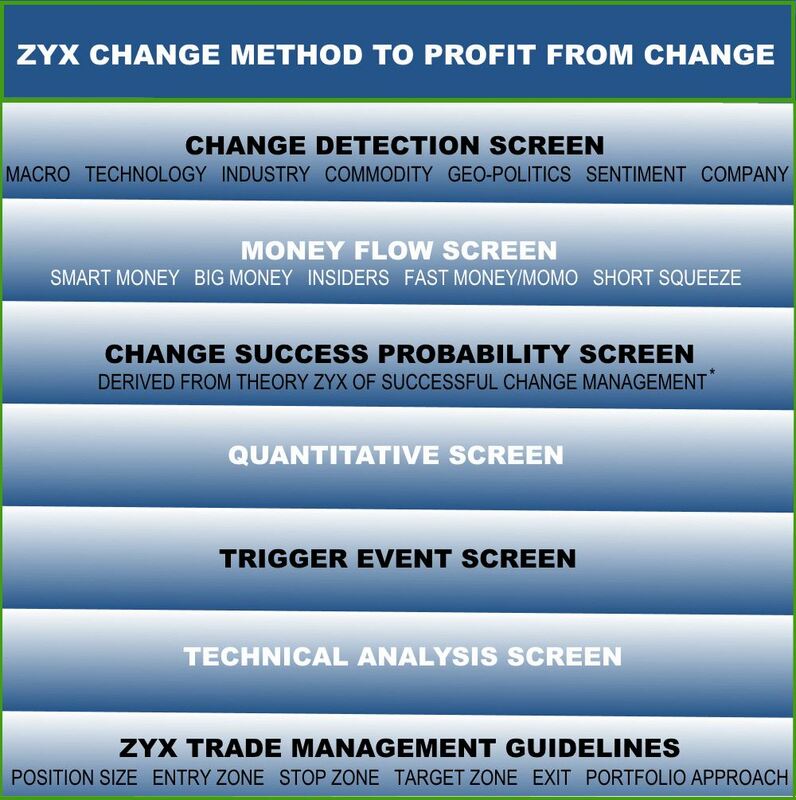 The diagram below shows the six screens of the ZYX Change Method for Investing and Trading. Roots of ZYX Change Method for Investing and Trading are in the widely acclaimed Theory ZYX of Successful Change. Theory ZYX is popular among CEOs and senior managers. ZYX Change Method for Investing and Trading is a derivative work with significant proprietary innovations built upon Theory ZYX of Successful Change Management including its integral patented ZYX Method.